While most traders are waiting for the FOMC minutes later, I’ve had my hands full trading penny stocks. That said, I’m up over $11K in realized profits today. Of course, I’ve got some positions on too… but I don’t like to count those chips while I’m at the table. And if you’re wondering about yesterday’s alert I sent, USA Technologies (USAT), I was able to a chunk off and book $9,000 in trading profits. Now, I’m still holding onto that position, and the plan remains the same… middle $4’s and maybe even $5 if it can get some good news. Now, if you missed my catalyst swing alert yesterday, that’s okay. Because today I have a new one for you. The stock market is all about seizing opportunities. For me, that means primarily trading off three simple chart patterns. However, there needs to be a catalyst and the risk to reward needs to make sense (value). My catalyst swing trades aim for returns as high as 20% over a week or two. On average, I like to find 10-15 of these trades a month. What I’m sharing you with you just one of my ideas. And if you opened my email yesterday, you already know how valuable these can be. Restoration Robotics is a medical device company dedicated to transform the field of hair restoration. The company designs and develops the ARTAS Robotic Hair Transplant System, the first and only physician-assisted system to harvest follicular units directly from the scalp and create recipient implant sites using proprietary algorithms, enabling patients to grow and get their natural hair back. It has unique expertise in machine vision, image guidance, visual serving and robotics. Geographically all the operations are primarily functioned through Silicon Valley, USA. If you want to understand the potential of a catalyst idea, simply take a look at our report on Pareteum (NASDAQ: TEUM) that was shared at the beginning of this year and compare it with its price action: a run from $1.7 until $3.7 now, that’s a +110% in 45 days. The true power of these ideas lays in the fact that a position is taken before the mass gets this stock on their radar. Once the mass sees the surf, we are already riding the wave! Of course, sometimes we lose energy by peddling for a wave that never grows to a giant wave but who cares if we hit more than we lose. Our next idea is related to a company that focuses on hair restoration which is an issue largely spread around the world. They have built an innovative robot that assists physicians. They market this robot as “ARTAS iX, the world’s only intelligent solution to offer precise, and repeatable harvesting with simultaneous recipient site-making and implantation functionality in one compact platform”. In Q3’18, a new version of their ARTAS robot was launched as the “ARTAS iX”. During this quarter, 11 systems were sold immediately while the sales grew further in Q4 to 17 systems. On top of this, first sales to Japan and European customers were done. This clearly shows a growing worldwide interest in this product. Read on to see why I’m long, and why I think this trade could return 30-50% over the next week or so. Until now, HAIR has not provided any guidance on revenues for future sales. Their CEO, Ryan Rhodes, said during their Q3 earnings begin November “… As I stated last quarter, we’ll not be providing specific revenue guidance until we have additional operational and sales experience and greater visibility into our future performance with the launch of the ARTAS iX System in the U.S. and other international markets …” Begin January, they announced preliminary Q4 revenue. The sales are around $6.6M, compared to $5.9 in Q4’17, and Q3’18 of $4,8M. They also hinted that their earnings for Q4 and full year 2018 will be planned to begin March. Until now no exact date was communicated. We will be looking for an announcement of the exact date and a runup into this date as they could indicate to share some (exciting) revenue guidance for the first time. On 13 February, Johnson & Johnson has agreed to buy robotic surgery firm Auris Health for $3.4 billion in cash. What has this to do with HAIR? Well, the chairman of HAIR, Fred Moll, happens to be the CEO of Auris Health. Any sort of a link with prior acquisitions could be fuel for rumors and price improvements. Let alone that a real acquisition would be done! During Q4’18, robots have been sold for the first time to customers in Japan and Europe. A prerequisite to ship to Europe was to achieve its CE mark what they received early this year. One of the European customers is the number 1 hair clinic in the Netherlands. We anticipate that these clinics will advertise more and more in Europe and generate more sale leads in the coming quarters. Any new customer in a new country could be the subject of a press release like they did before. In the past HAIR did offerings to foresee in their working capital. The last offering was in August 2018 for which the necessary documents were filed with the Securities Exchange Commission (SEC) in 7 days i.e. form-S, effect, offering prospectus. On 27 November, they expressed the intention to do a new offering by filing a new Form-S that has been put into effect. Until now however, they haven’t done the actual offering. This makes us believe that this time they are waiting on a better time to do this. A better time means of course a better stock price. At the end of December the stock price dropped below $1. If a stock price remains below $1 for 30 consecutive days, they get a notice of delisting from the NASDAQ. Lucky for them, their price went back above $1 after 26 days. Did the management tried to help the price bounce? Who knows? But their press releases during that period on achieving the CE Mark and the preliminary positive Q4 results were not pressing the price down for sure! Nevertheless, they failed to comply to another NASDAQ rule namely the $50M minimum market value (number of shares multiplied by the share price) and got a request on 18 January from the SEC to solve the issue before 17 July 2019. Their best way to sort out this issue is to have their stock price and the number of shares increased. With the earnings call probably set in a few weeks, we anticipate this will be the time to spread some positive news. Our ideal scenario is as follows; HAIR announces their earnings date begin March and indicate they will provide for the first-time sales guidance for 2019. These sales estimates will be very optimistic, making the price shoot up, ideal for them to do their offering. The idea is to buy the stock with a first stop level around $.65. A first price target can be set around $1.2 with a second target around $1.5 that acted as previous support. 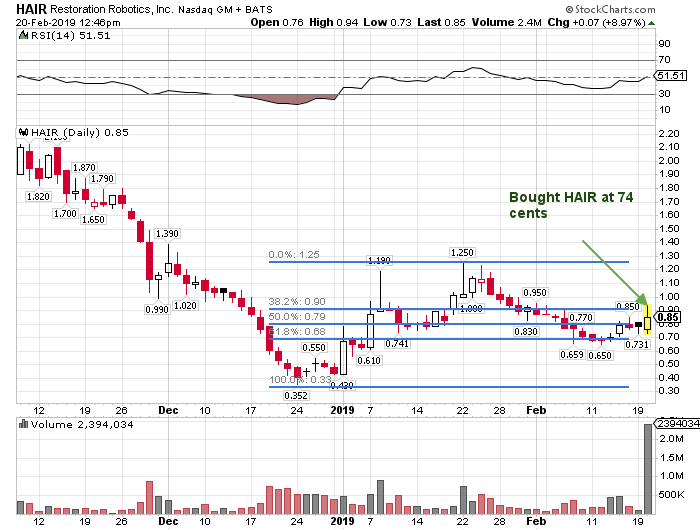 Here’s a look at the chart I was looking at on HAIR. This is one of my three money-making patterns, and you can see clearly why I would stop out below 65 cents on this (it’s a key Fibonacci retracement level). Now, if you want to know my full trading plan on this symbol and others it’s easy. All you have to do is fill out this form and you’ll get access to all my entries/exits in real-time, via chat, text, and email. This entry was posted in Jason Bond Picks and tagged Day Trading Success, How to become a successful day trader, Jason Bond Millionaire Roadmap, Jason Bond Millionaire Roadmap Customer Review, Jason Bond Millionaire Roadmap Review, Jason Bond Millionaire Roadmap Reviews, Jason Bond Millionaire Roadmap Scam, Jason Bond Millionaire Roadmap User experience, Jason Bond Penny Stock Playbook, Jason Bond Penny Stock Playbook Review, Jason Bond Penny Stock Playbook Scam, Jason Bond Picks, Jason Bond Picks Customer Review, Jason Bond Picks Review, Jason Bond Picks Reviews, Jason Bond Picks Scam, Jason Bond Picks User Experience, Jason Bond Swing & Long-Term Trading, Jason Bond Swing & Long-Term Trading Customer Review, Jason Bond Swing & Long-Term Trading Review, Jason Bond Swing & Long-Term Trading Reviews, Jason Bond Swing & Long-Term Trading Scam, Jason Bond Swing & Long-Term Trading User Experience, Jason Bond Ultimate Penny Stock Guide, Jason Bond Ultimate Penny Stock Guide Discount, Jason Bond Ultimate Penny Stock Guide Real User Review, Jason Bond Ultimate Penny Stock Guide Review, Jason Bond Ultimate Penny Stock Guide Reviews, Jason Bond Ultimate Penny Stock Guide Scam, Jason Bond Ultimate Penny Stock Guide User Experience, Jason Bond Ultimate Penny Stock Playbook, Jason Bond Ultimate Penny Stock Playbook Discount, Jason Bond Ultimate Penny Stock Playbook Free Download, Jason Bond Ultimate Penny Stock Playbook Real User Review, Jason Bond Ultimate Penny Stock Playbook Review, Jason Bond Ultimate Penny Stock Playbook Reviews, Jason Bond Ultimate Penny Stock Playbook Scam, Jason Bond Ultimate Penny Stock Playbook User Experience, Jason Bond Ultimate Strategy Course, Jason Bond Ultimate Strategy Course Discount, Jason Bond Ultimate Strategy Course Real User Review, Jason Bond Ultimate Strategy Course Review, Jason Bond Ultimate Strategy Course Reviews, Jason Bond Ultimate Strategy Course Scam, Jason Bond Ultimate Strategy Course User Experience, Making Money with Jason Bond Picks, Nathan Bear, Nathan Bear Millionaire, Nathan Bear Millionaire Roadmap, Nathan Bear Millionaire Roadmap Login, Nathan Bear Millionaire Roadmap Review, Nathan Bear Millionaire Roadmap Reviews, Nathan Bear Millionaire Roadmap Scam, Nathan Bear Millionaire Roadmap Success, Nathan Bear Picks, Nathan Bear Picks Login, Nathan Bear Picks Real User Review, Nathan Bear Picks Review, Nathan Bear Picks Reviews, Nathan Bear Picks Scam, Nathan Bear Picks Trade, Nathan Bear Picks User Experience, Nathan Bear Picks Website, Nathan Bear Raging Bull, Nathan Bear Results, Nathan Bear Scam, Nathan Bear Trader, Nathan Bear Trading Chat, Nathan Bear Trading Room, Penny Stock Playbook Free Download, Real-Time Swing & Long-Term Trade Alerts, stock pickimng service, Stocks Under $10, Why You Need to Trade Stocks with an Experienced Community, winning small cap swing trades, Your experience with Jason Bond Pick. Bookmark the permalink.